Anyways here's the scariest LT fall I've seen and it's Tyler Goff. Mike Blumel it looks like posted this one and a couple others. Has anyone heard about the timing debate at the last world cup in Calgary. Well the Zebras gave the W to Shani in this race. Shani won this race by .02. What do you think? They are saying that Kuipers skate was OFF the ice???? It makes you question whether the computers are always right? I guess it's better than the last sport I did which was hockey. Sort of like the HAL 2000. The Electric Eye is always right....we put alot of faith in computers and this is scary. Makes you question timing for sure. The finish line judge said at the SLC WC that the refs take the time off the whatever part of the skate is on the ice. Shani would have tied Jeremy there if he kept his foot down he said. The Electric Eye....my high school musical taste. Thanksgiving holiday was great. It started for me Wed morning when I hit the alarm button and went back to bed skipping ST practice. Visited the wife's family in Green River, Wy. Had great food, watched alot of football , slept alot and got back on my bike for a couple of short cold cold rides back in SLC and slept some more. I forgot how much I like riding my bike. One thing about training hard which new people including myself back then don't realize is you need to rest for positive adaptations to occur. Stress (training) is the stimulus for growth but rest is when the growth occurs. I remember back in 2001 November seeing Catriona Lemay during the Can Ams. She was telling me how she had 4 or 5 days off and this was a couple of months before the Olympics. One other thing that needs to be repeated. "The least amount of the most specific training which brings about continous improvement". That's a good motto for training. If you are going slower take a break or change something up. My favorite show on TV is tonite. You really need to see Frank Caliendo. You can find some of his stuff from the 1st show last week on youtube. He's so talented. Here's a summary of the show. I don't get excited about much on TV but this is so funny. He had a great sketch about Jenna Bush's wedding night and her father's advice. As far as training goes, we are so lucky here to have some of the best skaters training here in ST and LT. Last night i had ZERO motivation to go to the rink. But once I got there I felt better. It was great to see familiar faces checking in (Leann sp?) and the building has a positive energy. As I walked in the track/ice, I saw Apollo doing killer jumps with Izzy, Simon Cho (i remember that kid in Pittsburgh ST Nats when he was 4 feet tall doing perfect pivots), Alison Baver with Jimmy Jang taking them thru the rounds. Mike Drews was doing his sprint work outs. Anthony Lobello was on the bike doing something. Anthony said that he is in the US Championships and should do well. He did a 1:26 9 lap TT with what looked like 14 second laps. He is so talented. The drive, passion and work ethic of those around me got me motivated. I played hockey my whole life till I was 29 and I need to see others training. I'm not one for solo training but have gotten better on the bike with it. Skated some laps on the LT last night then this morning got up early (it's still dark out before we get on the ice). It's really cool to see the sun rise thru the windows and glisten on the ST ice. We had a huge group as ST National guys/gals who aren't in Holland are here. Apollo showed up which was cool. I think I last skated with him in 96 in Boston at a club session there when Pat Wentland coached him. I just remember noticing how much pop he had in his legs back then. We had a 9 lap TT on the docket but I passed on that one. Jonathon did a 1:35 a PB by 3 seconds. I raced 3 times last week (ST Ogden, LT club pack, and 9 lap TT). I felt like I just did a 9 lapper since that was the last time I skated ST.
Anthony Barthell fell early and seperated his shoulder. Heal quick buddy. He is one tough dude. Jessica Smith fell head first but was ok and Tina Koenig took a fast fall during 13 lappers. I think there might have been another couple of falls too. I didn't see Tina's as I was in the back of a huge group including Derek Parra's skaters. Chris Creavling and Sebastian Cano are leaving for Mexico with Mexi-Kraan for some rink opening. Sounds like fun. Derek was back from spending time with his daugher and Florida and he said he wasn't feeling good. I wish I didn't feel that good as he is a weekend warrior skating before work. He's one our stronger guys. He doesn't have the gold card because he is weak. All I know is I hung in for a bit then jumped in the last few laps and Apollo was finishing them at 9.2. They were taking the first one out at my top speed which is 9.5. Those guys were working hard. You couldn't notice it during the skating (they look so relaxed). Relaxing is the key to speed. One other guy who is in town is Chris Weaver who is the new development guy for US Speedskating. He was doing the same thing as me.....skating before work. I asked him how he was (great dude) and he said how could I not skate with ice here in the morning. Mike Kooreman kept it all together this morning with Jimmy Jang coaching the others. Oh and Mike's wife Kelsey was on the bike when I got there with local bike stud Mike Sohm. She was still riding when I left like 2.5 hours later. That's cool and sums up my morning. Thank God for all the blessings in my life. Good luck today and tommorow to Oval SSC members Jerskater and Jvalid (Jerica Tandiman & Jonathan Valdivia) as they are competing in the US Jr ST Championships in Bay City. If anyone sees results let me know. It was super fun and the ice at the Ogden Ice Sheet is the best. It was fast, hard and grippy. I skated a PB in the 3k which was cool and had a fast 500m. We had two kids from the Ogden club and the usual suspects (Mike Drews, Tim Peck, Teri, myself and Adam). It was 5 races in 2 hours which was cool (1000, 500, 1500, 3k demo relay and 3k). Thanks to all the volunteers, coach Leif and Jay Glad for putting on this event for the 16th time. I love ST.
One kid from Odgen fell in the first race. he didn' have gloves or knee pads and came off the ice crying. Tim gave him some knee pads and I had extra gloves. He raced the rest of the day and had a smile on his face. That made it all worthwhile for me. You could see how excited they were when we did the relay. The last race was the 3k. The starter told the two kids it was 27 lap race. They asked if it was in relay format???? The starter told the kids that it was all 27 for one person. The kid had a puzzled look.....i'd have to agree to that. 27 laps? Yes 27 laps is a long way. Here's the real WHIP (Wheels to Ice?) program. It's been a pleasure to get to know some of these talented skaters. They have a great coach in Derek and he's made some huge gains with his skaters. I know there has been some negative feedback on this program but at least someone is getting extra funding. It's really brought alot of new faces to the ice here in SLC. 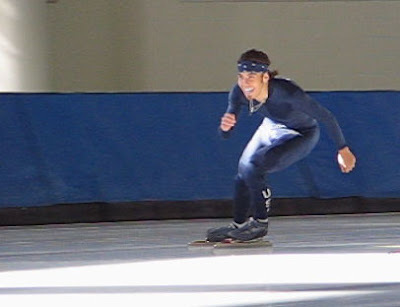 I don't know if you have heard of Cris McCann but I hear she is making huge progress towards a Gold Medal in Speedskating for 2010!!!! Check her out! Haven't listened to any others. I have to go to bed as 6am comes early. As for this past weekend I could write a book about the skating at the World Cup. There are 100 people with a 100 stories and the best ones aren't always about the winners. But we as humans focus on the winners. Sometimes you learn more about yourself and a person when they lose. 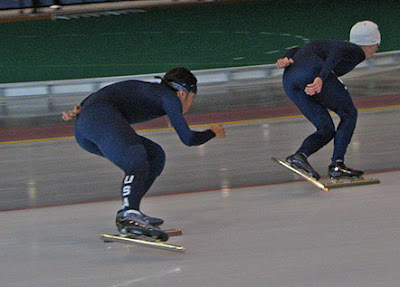 In any one speedskating race there are alot of losers if you define winning as 1st place. 500m - Wotherspoon 9.59 opener wow i know that's fast for him. I focused on him the lap and watched his skating. Effortless speed. Enters 2nd turn so easy.....thinking he's not going for the record in my head. Looks too easy. His last outer looks good.....looks to be getting powerful pushes passing me. But he's not going fast (easy speed)......maybe 34.2/34.1.......what that was a 34.03....24.44 lap......wow. First WR that did not have a benefit of an American draft on the backstretch. Actually what makes this one unreal was there was no draft at all. Great to see him back on top of his game. I was expecting a WR after 34.3 in a Calgary weekend TT. Two Koreans Lee's both looked fast. Those fast moving short guys look alot faster than the long lean legs of Jeremy's effortless pushes. I didn't get to the races till 7th pair. Kip had a good one but I missed it. Should be an interesting season on the 500m. Where does Wotherspoon go from here. 33? It's his first real race in a while. Good for him with his last two Olympic experiences. It appears that he just skated which I've talked about before. What attracted me to this sport before I could do it was how effortless the best make it look. That was one of those races that look easy. 1500m highlights - Bokko new Nor national record. Personals for the Norwegians all (Sverre, Christian and Michel). the young kid Stian fell hard. he's not skated ever at Calgary or SLC till last week. Fabris - opens his own pace against pairmate and goes 26.2/26.4/26.6 To anyone who has ever done a 1500 (any human) this seems superhuman. Wennemars/Davis battle.....great race. I look at the WR/TR.....WR doesn't change but TR does.....hmmm what happened. OMG he equaled the WR. strange. Morrison surges coming out of the 3rd last turn on the inner and really puts the hammer down coming in. Women's 1000m - I love the way the Chinese girl Wang skates. So nice technically. She swept the 500/1000. Good day for her. Jared Eborn writes about the oval and the lack of organization of the "press conference". They let the press know an hour before that there is a "press conference". Also, he has an entry today about an autograph session of the ST Team Sat night. There was no mention of the B group skating at 9am on most days and it looks like the isu.org website is down as well. No pairs or start times to be found anywhere and you wonder why we have only "our own fans" as my wife says. Some info about a World Cup skater I met at the oval last week. He hopped in during some of our laps. We raced on Saturday. He's a great guy and postive person here from Swissland. He is 38 years old and an ex hockey player and didn't start skating till he was 30. Wow can we have anymore in common. We talked about our 500 on Saturday and we both were "tight" as he said. The time didn't matter he said as how we skated.....very tight and forcing it. How do you relax in a 500. The first thing is to loosen that jaw and RELAAX. I thought for sure we did a high 37 since I didn't miss any steps but when you don't have power in each push you go slower. I'll be cheering for my new friend on the 1500 and 5k for the Swiss team this weekend. He said he's still trying to get the ice feel since he hasn't been on the ice that long. We take for granted here what others have to wait for. Quebec's Gaeton Boucher oval just opened this past weekend and Lake Placid's Bunny Sheffield oval will not open for another few weeks. UPDATE: SHANI IS HERE AND WILL SKATE! from Shani's website......any comments on this? 10/30/07:USS Executive Director, Bob Crowley: "It has been decided that the two individuals that you requested to receive coaching credentials will receive an access credential to the Utah Olympic Oval for the World Cup event in Salt Lake City. They will not, however, receive on-ice or locker room privileges." 10/31/07: Since Shani does not train in a U.S. program and USS requires Shani to pay his own travel expenses to world cup events, I informed USS of Shani's withdrawal from the Salt Lake City World Cup. 11/2 Update:USS' reasoning for not allowing Shani's coach access to the ice and locker room area at world cup.Guy Thibault: "Maria [Lamb] made the national allround team. She accepted her position on the team but asked that Tom [Cushman] be on the ice for world cups & world championships. That request was denied back in August.The tickets will limit you to the bleachers area. The accreditation [that USS has offered Shani's coach] gives you [the coach] access to the side of the rink and the tunnel.I [Guy Thibault] didn't state that there was no policy [regarding private coaches]. I [Guy] said that there was nothing written that says we HAVE TO grant the [on ice] accreditation.I [Guy] didn't propose a new policy (at least not yet). Our philosophy is to limit as much as we can the access to the ice and support our actual coaches better. "You or Shani will need to officially decline his position at the World cup in SLC for us to invite the alternate. Until we get a official NO in writting [DONE 11/1], we can not contact the alternate.Posted by daviscil. Highlights today in racing was seeing Bokko fail in his WR attempt on the 3k but skate a 3:40. Man that was great and this kid is flying right now. Expect big things out of him this year. Pechstein skated a 4:00 like clockwork as well. Kipper (Kip Carpenter) won the 500 with some fast looking turns and the other Norweigians Sverre Haugli and Oystein Grodum had what i would assume were good 3k's. My pair mate who I didn't see after 200m was Pascal Briand who skated a French record on the 3k with a 3:49 only to see it beat by his countrymate two quads later with 3:46. My legs were feeling tired today. Did I mention that i got passed by all 3 guys in my quad skating a 4:17. Last time that happened to me was back in 1996 in Roseville during a 5k when I opened with the fastest 1st lap (with KC Boutie, Matt Kooreman and Dave Paul). Limped in with a 9:15 i think back then. I wonder why my legs didn't feel good? Let's see skated all the races last 3 day weekend (500x2, 1000, 1500, 5k, and 10k) took one day off. Then trained all week with the Norway guys, plus weights, and dryland. Then couldn't take Thursday off cause I felt so good on the ice. Skated with fast old man Boris Leiken and his inline cronies. Blew my load bigtime Friday ripping out fast laps. Oh yea did I mention I'm on antibiotics as well for a cellulitis infection in my thumb. Excuses, excuses. Champions don't make excuses but that's the truth. Warming up today Mark Chrysler asked me how were my legs. I responded tired as we did easy laps. I hate to verbalize that and was hoping for the magic cure for tired legs warming up. It never happened. A month ago 7 laps of 32s was easy today 33s/34s were hard. My muscles actually hurt bigtime during my 3k. Proud I could keep a flat race with how I felt today. The timing was screwed up during my 1st two laps. Thought I was doing 32s but really was 33s then 34s and high 33s last two. At least it wasn't a bomb like my 5k last week. I did a 32, 33, 34, 35 then punted. Peter Schotting said you should do more crappy 5k's before your 1000m. I don't think he's seen that before with the level of skaters he's coached. Afterwards, the cooldown laps felt good though. I got a lot of training in the bank this week though for later. I know the deal after doing this for a while. This was supposed to be a rest week for me but I'm keeping it going because I'll probably be shut out of working out with NOR next week on the World Cup ice. I'd rather not talk about my races as I wasn't too happy with them but it's part of the process for me. Weights, trainer turn cable and some dryland after. No secrets to going fast other than hard work followed by rest. Highlight memories from today: Seeing Enrico Fabris skating around the oval. I've always like his technique. Man that guy skates LOW. Doing cool down laps during the last pair (5k) he was actually drafting off ME for laps at a time...hmmm. Then I think he got bored and took off. He looks so good. I saw a Green guy from TVM come flying by while I was on the bench. I thought it was a sprinter because he looked so explosive and FAST. No it's Sven Kramer the distance guy....wow. Later the Koreans were training and those guys all look soooo low and explosive. Day 6 of my Norwegian Fantasy Camp. We are racing tomorrow so today is a prerace workout. There are not many secrets to race prep. You do some warm up laps, some accels, some rolling starts, maybe a standing start. I knew we would do some tempo laps today as well, and we did an 800m. Andrew has a picture of the last turn. That's me in the back with a pretty good left push. Skating Short Track with the New Edge and Mike Kooreman has helped me so much, I am skating faster than I ever gone before. This 800m was new personal (in the draft) 25.3/25.5 even though we had to put in some sick moves to wind our way through the crowds at that speed. Ok so I have a fast 800 in my legs now we are going to do a 400m flyer. I know that Michel or Chris are going to lead (Christoffer Rukke & Mikael Flygind Larser). I figure this is going to be sub 25 since the ice is better today and grippier. They are dialing it in for next weekends World Cup. The World Cup circus is in town now. We now have double or triple the number of skaters on the ice now since the resurface. On the warm up laps after the break, we get passed twice the outside by Dutch team then Utah FAST team doing something (i heard 28). Coming into one corner we are like 6 across with skaters in the inner warm up lane, skaters in our lane, the Dutch in Green suits on the outside and some group passing us in the inner comp lane. I hear someone go down behind us. Someone must have got freaked out with that many people. One of the Norway guys says this is fun with so many people. So we are off in the 600m (one lap tempo). I hit the first turn with big speed and don't set it up too well. The ice is really rutted and I didn't enter deep. I'm down sliding on the ice at high speed. I look up and I'm heading towards two of the best skaters in the world (Sven Kramer and Carl Verhaijen and some other Dutch guy in Green). We make eye contact and I can see the white's of their eyes as I'm marking up the track trying to slow down. They hustle up and do a quick roll start. i hit the pads. Luckily I check everything and I'm ok. My elbow hurts but thank God no one was hurt. I knew those guys were on a good one and they say it was 24.8....maybe next time. Mark and I had a good laugh about that one afterwards....you really had to see the look of fear on those guys faces as I was sliding towards them at mid 30mph pace. I remember seeing Shimizu fall at a practice before SLC World Cup a few years back head first fast and a Dutch Girl jumped over him as he slid by her and hit the pads. The new rules at the rink are good (stay to the inside going slow) but not everyone follows them. One other thing that was cool at the playground (as my wife calls it). Apollo made his appearance on Long Track with Clap Skates. Check him out. He's having fun that's what it's all about!! I'm pretty sure that's Jordan Malone in the picture as well. Some of the other STers were out there. I was hanging with E (Ian Baranski) and he told me to be careful out there as I'm an old man! Ian said that he was more freaked out than warming up for a ST World Cup with all the skaters out there. I saw him race Long Track way back in 1997 in Lake Placid and I mentioned that to him. I did forget that we weren't on claps back then. He and Danny Weinstein raced the coolest pack style Long Track I've witnessed. I remember the 1000m which one of them won by a whisker. Nothing like some good Pack Long Track outside at Lake Placid on a clear sunny day. That's what heaven would be for me I think. Apollo agreed that Pack LT is fun. One last thing that Peter said to me leaving the rink is he expects to see a Personal in my 500m. I hope so too but I need to just focus on the process and the results will follow...ie. focus on my technique, sitting low and generating pressure. I was joking that I could have taken out the Dutch team for him. He said they won't need that. They will do it on the ice. A true champion and pro coach.